Increased brain fluids can cause life-threatening increase of pressure within the brain during neurological disorders such as stroke, brain trauma, hydrocephalous and idiopathic intracranial hypertension. I am interested in understanding the disruption to the normal production and outflow of the brain fluids during stroke, which can also be important for developing therapeutics for other disorders with impaired brain fluid dynamics. The Blood-Brain Barrier (BBB) is the protective physiological barrier that prevents circulating infectious agents, toxins and large molecules from entering the brain. The BBB is disrupted in many neurological diseases, making the brain vulnerable to further damage. My research on the BBB has two main aims: 1) to develop cell culture models that mimic the human condition for investigating the true pathophysiology, and 2) to discover therapeutics that can safely cross the barrier to reach their targets within the brain. The brain fascinates me. It always has been since I was very young. I wanted to unravel the mysteries of the brain, as that could be one of the most important puzzles for the humanity to solve. I chose to focus on the blood-brain barrier (BBB) – the ‘gatekeeper’ of the brain that controls what can get in and out of the brain. My ultimate research goal is to understand the ins and outs of the BBB, which can lead to reducing the burden of brain diseases such as stroke, brain trauma, encephalitis, brain tumours, and Alzheimer’s disease in millions of people. Frustratingly, many drugs that could be effective against these diseases are unable to reach the brain because the BBB stops these drugs from getting into the brain – one of its ‘gatekeeper’ functions. I would hope my research would help obtain a ‘gate pass’ for these drugs, so that we can treat these diseases effectively to make a real difference to the lives of patients with brain disease. Dr Adjanie Patabendige is a research fellow with significant research expertise in cerebrovascular biology at the University of Newcastle and HMRI, with career grant funding over $1.6 million. She also holds an honorary position at the Institute of Infection & Global Health, University of Liverpool, UK. Dr Patabendige was among the first 10 students to graduate with a research-focussed Neuroscience (Honours) degree at the prestigious King’s College London (University of London), UK. To fulfil her passion for understanding the brain, she undertook doctoral studies under the mentorship of Prof Joan Abbott at the Blood-Brain Barrier (BBB) group, King’s College London. During her PhD, she developed a cell culture model of the BBB using cells extracted from pig brains to mimic the human BBB closely. This is one of the most robust and reproducible primary BBB models currently available, and is being used by many researchers and pharmaceutical companies for drug screening and functional studies. Following her PhD, she spent a short period working with pharmaceutical industry partners, including UCB Belgium and Syngenta UK before moving to the University of Liverpool, UK. Her postdoctoral research at Liverpool was focused on developing a human BBB model to study viral encephalitis (inflammation and swelling of the brain). Here she worked with containment level 3 viruses (which can cause serious and potentially life-threatening disease) to investigate the mechanisms of viral entry across the human BBB, and the resulting inflammatory response. In 2012, Dr Patabendige was awarded one of the inaugural David Sainsbury Fellowships from the National Centre for the Replacement, Refinement and Reduction of Animals in Research (NC3Rs, UK) for early career researchers. The University of Liverpool awarded a Tenure-Track Fellow position to Dr Patabendige in 2014 recognising her potential of becoming a future research leader. Dr Patabendige relocated to Australia in 2014 to continue her fellowship research with collaborators based in Melbourne. In 2016, recognising her expertise in BBB and cerebrovascular biology, Dr Patabendige was recruited to the Translational Stroke Research Group at the University of Newcastle to head a laboratory team working on an NHMRC funded project on intracranial pressure and hypothermia treatment for stroke. 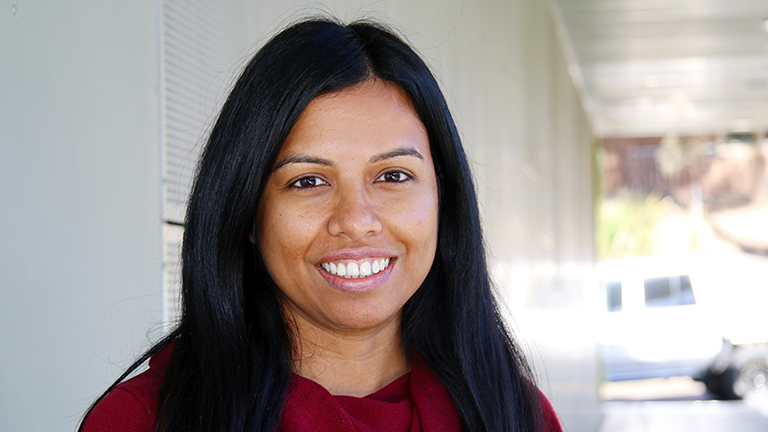 In 2018, Dr Adjanie Patabendige was awarded a NSW Health Early-Mid Career Fellowship to lead a study on early neurological deterioration in ischaemic stroke. Frustratingly, up to a third of stroke patients who present to the hospital with minor or rapidly improving symptoms, suffer early neurological deterioration (stroke-in-progression) within the first 24hrs post-stroke. The cause of this early neurological deterioration and the underlying mechanisms are poorly understood. Dr Patabendige and her team will use advanced medical imaging analysis and a novel non-invasive method to measure the pressure within the skull, and investigate the effects of swelling of the brain to understand the true pathophysiology and recognise those at risk. I am focussing on providing significant fundamental knowledge about impaired brain fluid dynamics in neurological diseases. I expect my research will help future diagnosis, treatment and management of these patients, thereby making a significant reduction in morbidity in the longer term. Working in collaboration with international pharmaceutical companies, I aim to explore options for delivering effective treatments for neurological diseases across brain barriers.